Hello Dennis, just purchased the BDA plans. I’m one of those “lucky” guys in the red zone (15x12x8) and I don’t see myself in a 14′ high room anytime soon. It REALLY doesn’t make sense to me when I see corner bass traps for sale that weigh just 15 pounds. Your plans (and the ACDA units of course) seem just the ticket. I have some questions. I was surprised to see the plans include the 2″ foam in the build. I was under the impression that these were going to use the carbon filters. You state that we can get 75% of the performance by buiilding this way. Is that because of using the acoustic foam instead of the carbon? It also seems that others have been sold the carbon filters yet I don’t see them for sale. Are they available for sale? If so, how much do they cost? I’m thinking of building two units to start with. I’m here in Los Angeles. Thanks for the great info, including the videos, that you make available to all of us novices. I’ve been enjoying the learning experience so far. I still want to know if the carbon is available for sale and now I have an additional question. That page mentions a “DIY Bass Absorber BDA kit”. Is that no longer for sale? That would be epic! I’m not looking forward to cutting those dado cuts myself. Z, The carbon technology replaces the foam inside the cabinet. It is 350 / BDA unit. The foam face is 75.00. Drawings are provided for the carbon filter build upon carbon purchase. Thank You sir. Hmmm, at that price I think I’d use the foam and live with 75%. 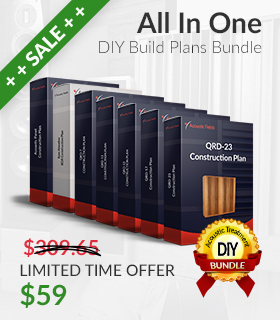 As for the BDA-DIY plan I just purchased, I’m confused with a couple of things. Perhaps some pages are missing? instructions for cutting these sheets).” There is no page number referenced and furthermore, I cannot find any pages that show you how to make the jig. to layout each sheet to maximize productivity and minimize waste.” I don’t see such a plywood diagram in my PDF. What does that mean? I don’t see any other reference to using a dado in the rest of the instructions. Does this new version of the build still require cutting with a dado? I would imagine so.